Philadelphia police are seeking help from the public to identify this man who allegedly shot at a car as it was trying to park in South Philadelphia. 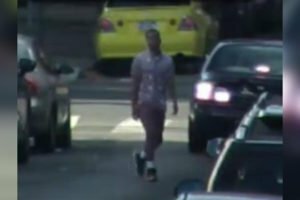 Philadelphia police are seeking help from the public to identify a man who fired several shots at a car as its driver – who was struck at least twice – tried to park on a South Philly street last week. According to police, the incident occurred at 6 p.m. Wednesday on the 2000 block of South 21st Street, and the victim was a 22-year-old man who suffered injuries to his face and arm. Video footage provided by police, shows the suspected shooter walking onto 21st Street from nearby Snyder Avenue. He then waited for the victim's vehicle. After the victim's car appeared on the block and as he attempted to park, the video shows the suspect firing shots into the side of the vehicle. The injured driver attempted to flee, police said, striking two parked cars along 21st Street before stopping on the 2300 block of Snyder Avenue. Police said the suspect – described as a male about 20 years old with a close-cropped haircut – fled east on the 2000 block of Snyder Avenue after the shooting. The suspect was wearing shorts, a T-shirt, white socks and black sneakers at the time of the incident, police said. The victim was transported to The Hospital of the University of Pennsylvania where he was treated for his injuries. Anyone with information should call Philadelphia police at 215-686-8477 or text a tip to 773847. Also, tips can be sent anonymously to police here.